I installed these locks in the lower kitchen cabinets to foil my too-clever-by-half cats who love to break in and cause havoc among the crockery. I didn't know what to think of the knocked-over cups and glasses until I actually watched one of the little thugs at work. He got on his back and opened the door with some effort, then crawled inside on his illegal mission, avoiding most of the objects, but bumping a few. I found the first lock a little bit tricky to align but then learnt from experience (I have Type 1 cabinets, with the door outside the frame). It is vitally important to clean the installation area (with alcohol in my case), because the sticky pads need to adhere firmly. It also helps to let the bonds cure before putting them to the ultimate test. They work reliably now, and I have found a convenient place for the magnetic knob that opens the locks, so it's always available but not in danger of getting lost. I think a spare one would have been handy, but I see that with the 8-pack and 12-pack, you get more of them. Apart from the clever security locking system, which is virtually invisible, I like that the locks can be disabled by pressing the latch down. During the daytime, I seldom need the cabinets securely locked and it would be a pain to have to use the knob all the time. These locks are obviously designed with the safety of small children in mind, but they are also keeping my cats away from fragile items and, even more importantly, safe from toxic cleaning products. This is a clever kitchen gadget that would make a perfect gift, or a welcome addition to the arsenal of a busy cook. I was sent a sample for testing and review purposes and, although I thought of it as a fun novelty, it has changed the way I cook. It is well made, versatile, accurate (as far as I can tell) and loud enough that you can hear it if you leave the room. 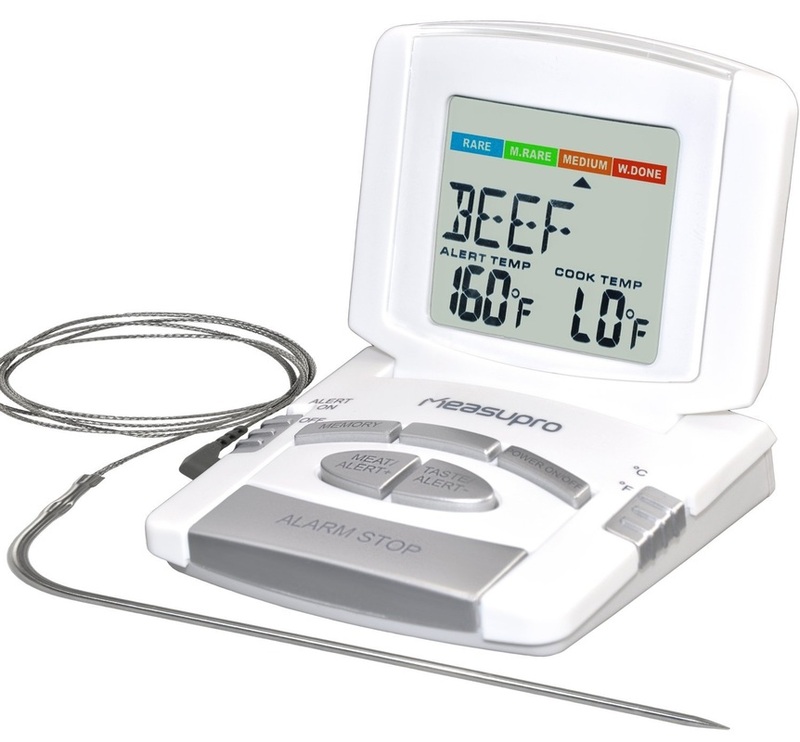 It is clearly designed to allow anyone to cook meat safely without relying on guesswork, timers, or your Grandma's vintage hand-written recipes. It is well known that many meats (chicken, pork and hamburger ground meat, for example) can be dangerous if underdone. But determining the correct cooking time requires experience and skill, as well as an accurate oven. 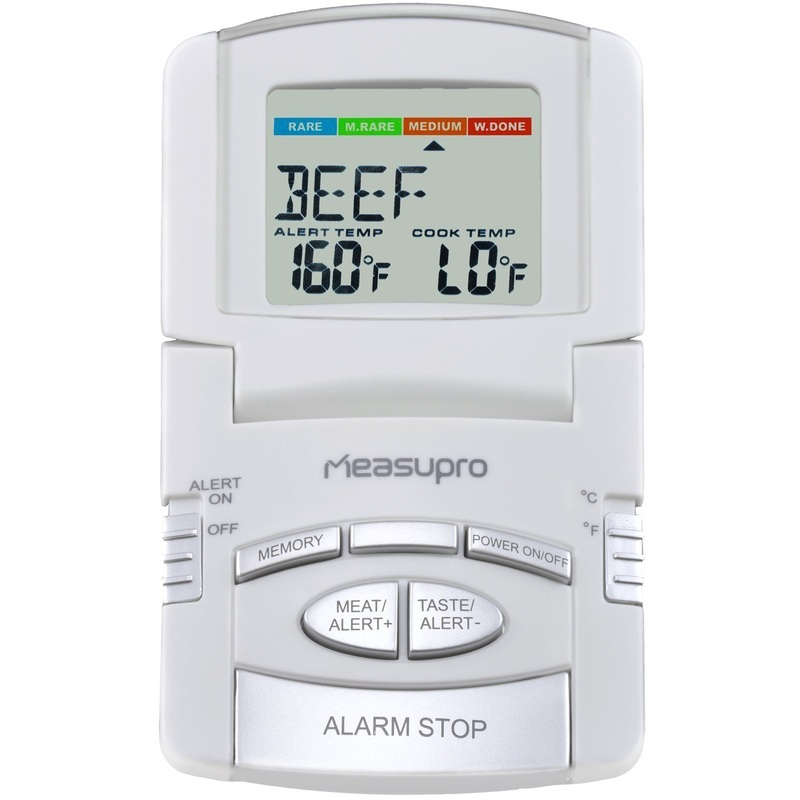 This handy thermometer will alert you in three stages. Pre-alert (10 degrees to the setting you have chosen), perfect, and overdone. The preset values are very useful if you are unsure about the specific meat, but can be customized and your choices stored in memory. The screen is very easy to read, giving all essential information and a useful running count-down display of the cooking time. The probe is designed to be inserted in the food and left inside the oven. 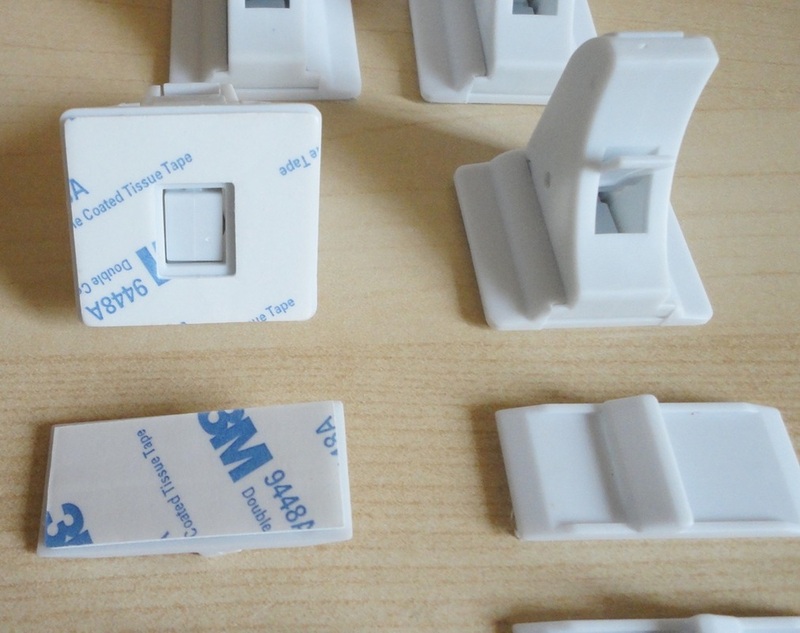 It connects with the display unit via a very thin, heatproof cord, which lets the oven door close completely. 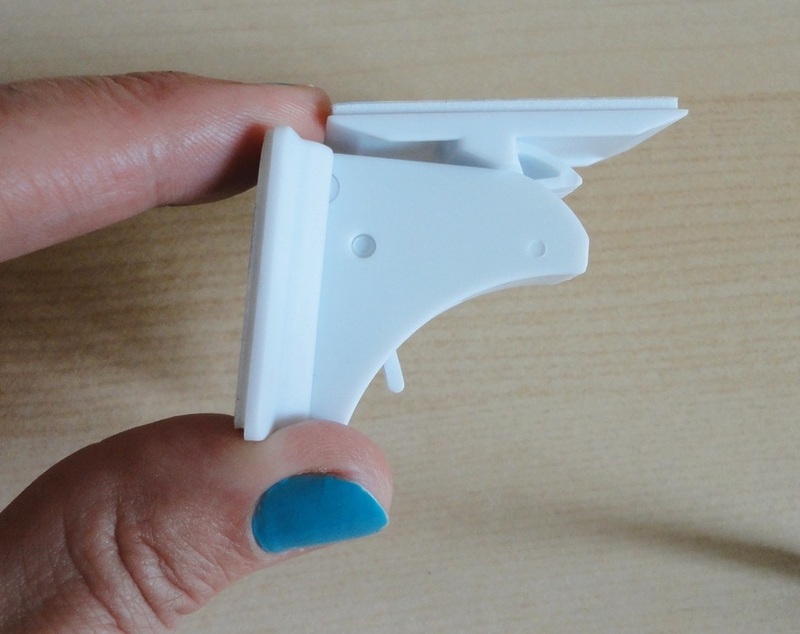 This is the best feature of this gadget, as it eliminates the need to open the oven door and take the food out in order to check the internal temperature. Great for both safety and accuracy, as food will cool down quickly once outside the oven. I really like the hinged display that can be set on a counter or attached flat to a metal surface. Another handy feature is the switch from Fahrenheit to Celsius right on the top. It's amazing how many cookbooks will only give you one unit of measurement and, if a conversion chart is provided, it's usually at the end of the book. For me, it saved the day just recently. I gave up meat 30 years ago, but we had a family reunion here at our house and I was the cook in charge. I remembered vaguely what to do with a joint, but I was trying to prepare a tasty meal, not just a safe one, so this thermometer allowed me to get a very good result despite my rusty skills! I use it more often for baking. I have developed my own recipe for very moist cake that can easily go one of two ways: overdone and burnt, or undercooked and runny. With a little experimentation, I have discovered the optimal internal temperature and now can confidently produce a correct texture without constantly taking the pan in and out. Bread-making is also much easier. It's hard to say whether this is the sort of thing that would be considered essential in the average kitchen. Some people have a garlic press, some use a knife. My friend uses an electric orange squeezer, I have a manual one. So it depends. 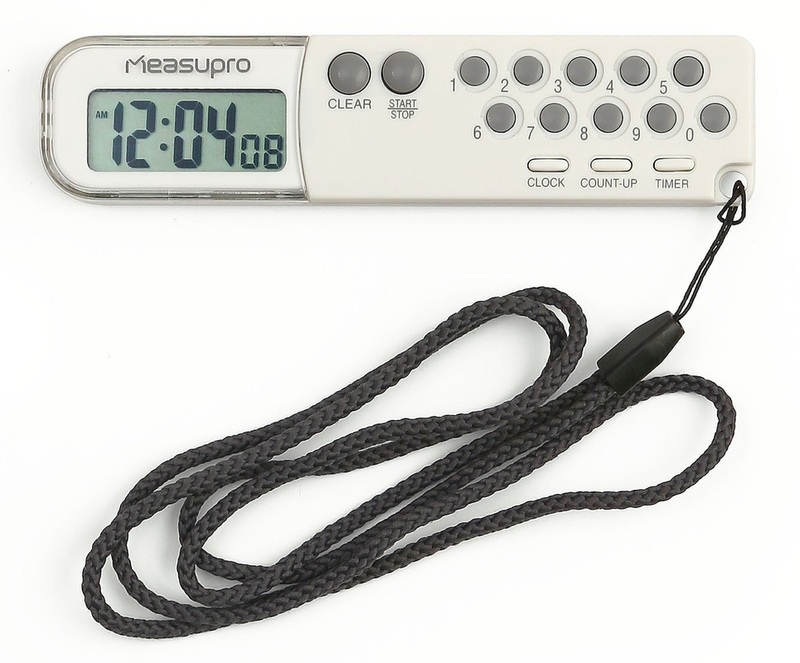 However, I can confidently say that compared to other cooking thermometers and probes that I have used, this MeasuPro model is a far superior choice, is easy to use and reliable, and should last well with normal care and maintenance. I am very impressed with this kitchen scale, especially since the digital kinds I have had so far have been disappointing. 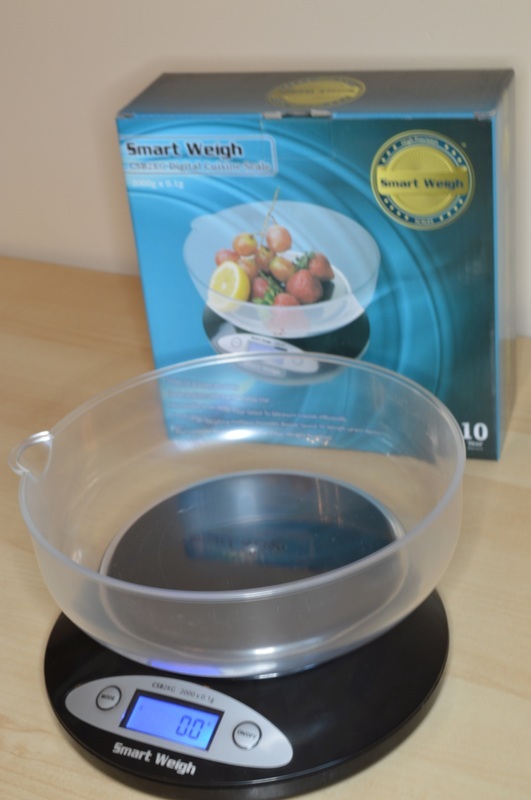 This item has the same look of quality as other Smart Weigh products I have tried, and the same extreme accuracy. Since I started baking seriously, I have realized how precise weighing is often essential to the success of a recipe. With an accuracy factor of 0.1 g, I can be certain that my preparation is as good as possible and even the lightest ingredients will be carefully weighed. Eggs, for example, vary greatly in mass and flour quantities can be deceiving because measuring cups are not very accurate and sometimes you cannot see the line clearly. Dry pasta and rice swell and what appears to be the same quantity often yields dramatically different results. The scale is sleek and compact, but wide enough to be stable. Batteries are included and already in place. A small strip needs to be pulled away to activate them. The clear measuring bowl has a small lip to ease out liquid ingredients and doubles as a cover, taking up no space at all when not in use. It is easy to clean and looks robust enough. The LCD display is illuminated and very easy to read, with large digits and a handy automatic off feature (although sometimes I wish the time interval were longer than 60 seconds). I love the option to switch between decimal and imperial units which saves me boring calculations, and, even more, the tare function to subtract the weight of the container, so I can use mixing bowls and other containers if I want. I'm very pleased to have been given this test unit. Now that the trial period is over, it has earned its place in my kitchen. For the looks, build quality and especially extreme accuracy, I think it is great value for money and the 10 year (limited) warranty speaks of great confidence on the part of the maker. I had been looking for a stopwatch to put some interest into my swimming sessions. When I accepted the offer to test and review this neat, lightweight gadget, I did not imagine how useful it would turn out to be. 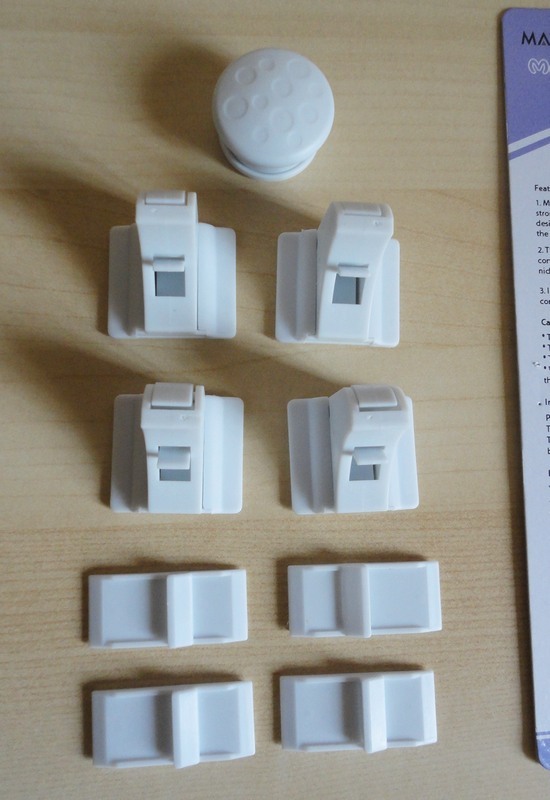 First impressions were very good: it arrived well packaged and, as usual with MeasuPro products, it already had the battery installed but protected by a removable strip of plastic. Versatility and convenience are the keywords here. There is a largish magnet on the back for temporary attachment to a metal surface and a lanyard long enough to go around your neck. The display is fairly large with clear digits that show up well in most daylight conditions. My only quibble is the instructions. Printed in white over a light grey background, they challenged my eyesight and I had to scan the page and enlarge it with enhanced contrast to make out the very small print. Also, although operation is fairly intuitive, the clock setting instructions are a bit incomplete, so I tried to improve on them below. 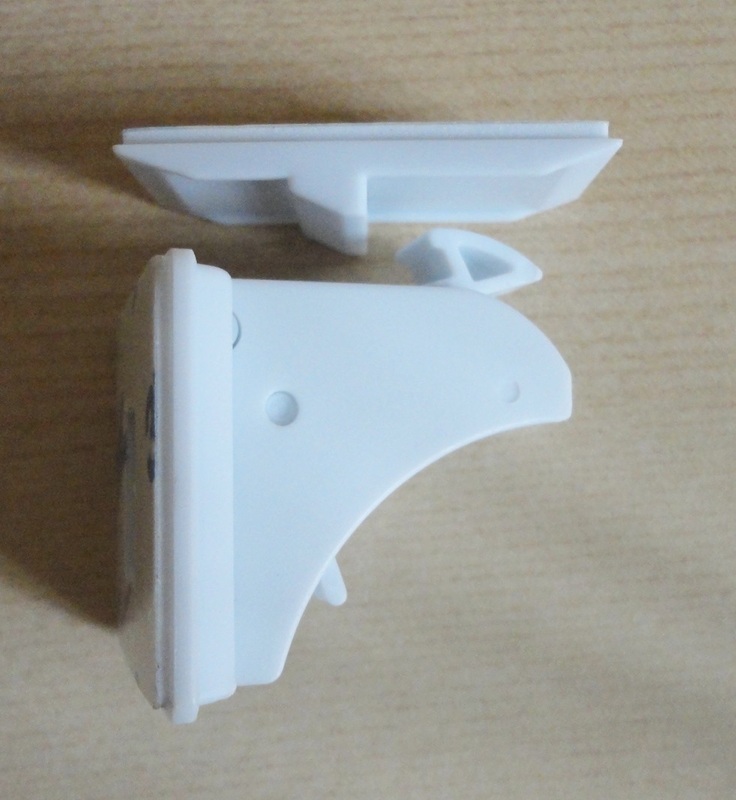 Build quality is high, the strong plastic should last very well and take a few knocks. 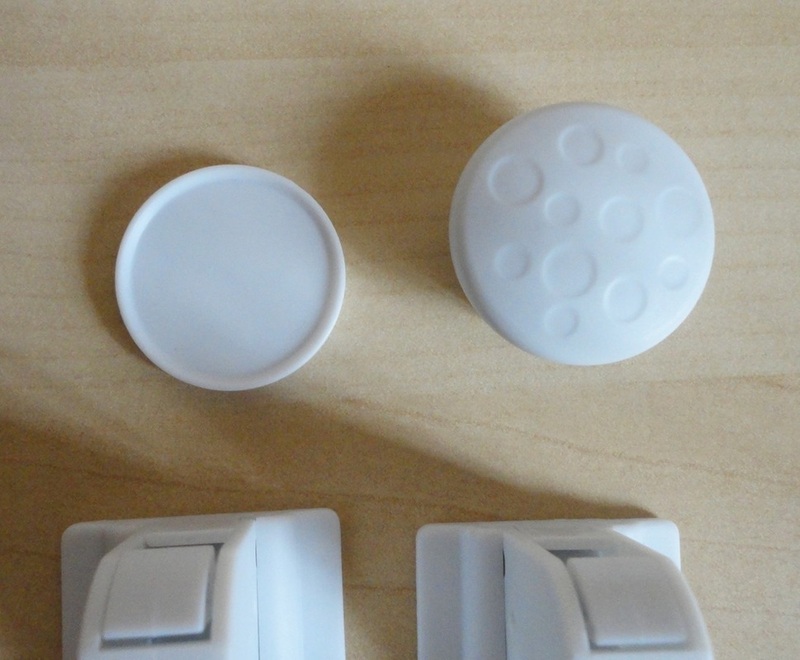 The buttons have a definite action and the lanyard attachment feels secure. The CCT100 can be used in three distinct modes, accessed via three small buttons at the base of the unit: Clock, Stopwatch (labelled as Count Up) and Timer. The Clock function shows hours and minutes in large, clear digits and seconds in smaller digits. To set the time, you press the Clock button for 3 seconds until the screen goes blank and a small thingy in the corner starts blinking; using the small recessed button at the back of the unit, select 24 hours or 12 am and pm display mode; you then enter the digits for the hour (starting with 0 for numbers lower than 10), then for the minutes AND the seconds (at which point the clock is reset and immediately starts working). The Count Up (Stopwatch) function is very easy. You press the Start/Stop button to begin the count and again to interrupt it or to end it. The unit beeps quite loudly in each case. Accuracy is to the nearest second, which is perfectly adequate for my swimming practice. Obviously it is more accurate if someone else is timing me! Once you have this gadget on your person, you will find yourself timing all sorts of things! The Timer (Count Down) function is equally simple. To set it for, say, 4 minutes 25 seconds, press the digits 4, 2 and 5 and then Start. The alarm is fairly loud and cannot be missed if you are in the same room. As soon as the set time is reached, an up-count starts showing how long has elapsed since the alarm started sounding. To turn it off, you press Stop. The last request still shows, so if you need to repeat the same count, you simply press Start again, otherwise you need to press Clear and enter a new number. The maximum value for both Count Up and Count Down is 9 hours (not 99 hours as per package), 99 minutes, 99 seconds. Why 99 and not 60, I'm not quite clear. Although I have a timer built into my oven, that only works if I am near the kitchen. So I use this little gadget a lot for baking and when making bread. This way I can be outside gardening and still be reminded when the rising time is over or when things are cooked. In conclusion, this is a well made, reliable, useful products that will make itself useful in many more ways than you can imagine.